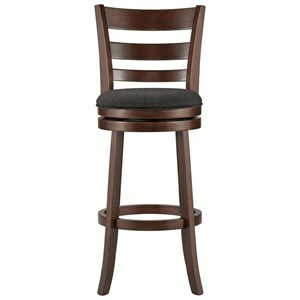 Complete your home bar space or breakfast counter setup with this swivel counter height stool. The piece has a versatile look with a classic ladder back, Dark Cherry finish, and upholstered seat. Stretchers give you a place to rest your feet, while the swivel seat allows you to easily move around in your seat. The Edmond Counter Height Swivel Stool with Upholstered Seat by Homelegance at Hudson's Furniture in the Tampa, St Petersburg, Orlando, Ormond Beach & Sarasota Florida area. Product availability may vary. Contact us for the most current availability on this product. Browse other items in the Edmond collection from Hudson's Furniture in the Tampa, St Petersburg, Orlando, Ormond Beach & Sarasota Florida area.